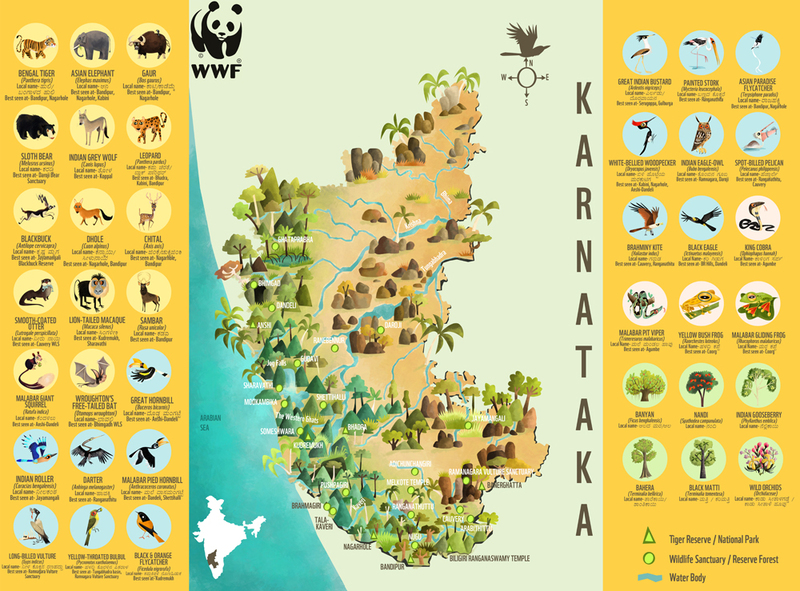 One of my recent assignments for WWF India was to create an illustrated map of Karnataka's wildlife as an interactive illustration to engage school kids in the state. Located in southern India, Karnataka is among India's most diverse regions, both in terms of wildlife as well as geography, that is comprised broadly of the Western Ghats (and the famed Nilgiris), the Deccan Plateau and the Karavalli coast. The resulting topography makes for a unique combination of rainforests, semi-arid landscape, grasslands, swamps, marshes, coasts, rocky terrain and river basins all within a single state! With some of the best eco-tourism and wildlife conservation services in India, the state of Karnataka houses 5 national parks and several other protected areas, the most popular among these being Kabini, Kudremukh, BR Hills, Bandipur, Nagarhole, Dandeli-Anshi, Ranganthitu Bird Sanctuary, and Banerghatta. Lesser known but equally interesting places include Daroji Sloth Bear sanctuary and Ramnagara (India's only vulture sanctuary). And as you might guess, the state is among India's most biodiverse regions, home to rainforest dwellers like the endangered Lion-tailed Macaques, hornbills, elephants, the King Cobra, and several endangered rainforest frogs; as well as inhabitants of scrubs and grasslands such as Blackbucks, Wolves and the critically endangered Great Indian Bustard. The map has been printed as an interactive chart, in which the animals and trees appear in circular cut-outs. Clues for the habitat and distribution of each animal are provided beneath the illustrations, to help the kids place the animals and trees on the map accurately. A big thanks to WWF India for commissioning me for the project!